The Christchurch tram network at its maximum post-war extent, on the day the St. Martins line (No. 12) was withdrawn. 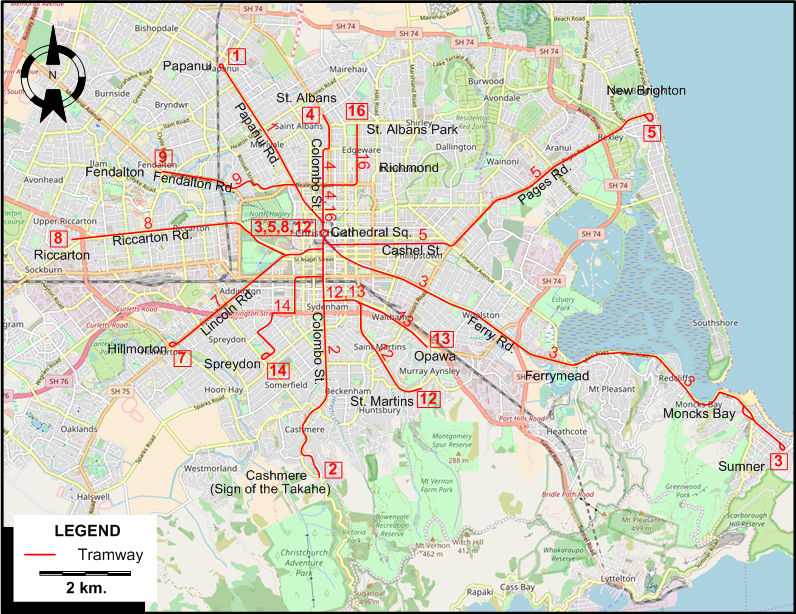 NB: Eight of the twelve tram routes in Christchurch were part of through operations: instead of terminating at Cathedral Square, they simply changed their route number and continued on the appropriate route. These routes are shown below under the combined route numbers, e.g. 1/2 shows route 1 between Papanui & Cathedral Square and route 2 between Cathedral Square & Cashmere. Steam tramways : 9 March 1880 - ?. Electric tramways (1st generation): 5 June 1905 - 10 Sept. 1954. Electric (tourist) tramway: 4 Feb. 1995 - 22 Feb. 2011 (suspended because of the Christchurch Earthquake); Nov. 2013 - today. Bush, G. "Christchurch - History on the move", Light Rail & Modern Tramway, Aug. 1995 (58:692), p.254-255. Bush, G. "Christchurch - History turns full circle", Light Rail & Modern Tramway, July 1995 (58:691), p.215-218. Price, J.H. 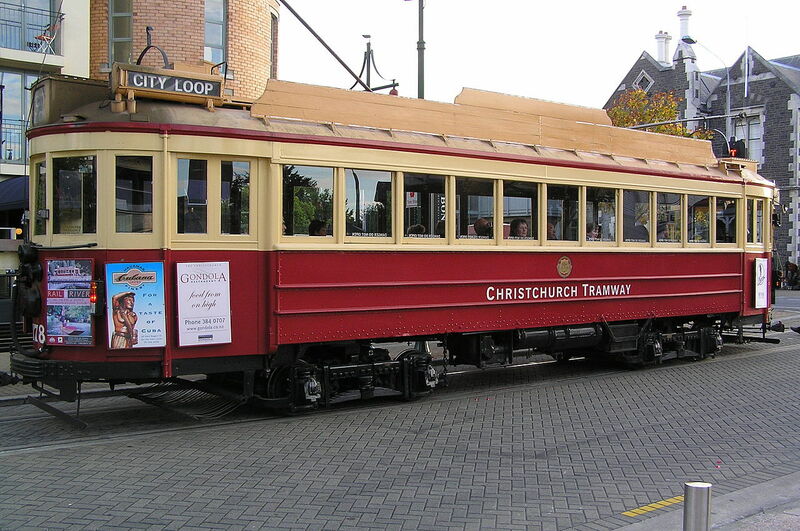 "Museum News - Christchurch", Modern Tramway & Light Railway Review, Apr. 1969 (32:376), p.122-125. Stewart, G. The end of the penny section: When trams ruled the streets of New Zealand. Wellington: Grantham House Publishing, rev.ed., 1993.